Battling with annoying acne? You are not alone. Over 85% percent people between ages of 12 to 24 develop acne. Increase of androgens make the sebaceous glands (oil glands) get larger and produce excess sebum. Pores get blocked with excess sebum and dead skin. The bacteria get trapped in clogged pores and multiply which results in acne. Acne can develop on any part of the body but most commonly observed on face, back and chest. Hormonal imbalance, improper lifestyle, unhealthy diet, stress, weak immune system and puberty are some of the reasons for acne. With proper diet and topical applications, one can get rid of acne. Instead of depending on commercial creams, you can trust simple home remedies to treat acne like lemon, garlic, and tea tree oil, honey and clay mask. Here, we will discuss about clay mask for acne in detail. Clay cleans the clogged pores and shrinks them. It controls the over production of sebum. It drags out toxins and bacteria present in the pores. It strengthens the connecting tissues of the skin and makes it look soft and even. It gives glow and radiant finish to the skin. It exfoliates the accumulated dead skin cells, dirt and dust. It helps in reducing the appearance of scars. It is completely safe for all types of skin. It decreases the inflammation and improves blood circulation. 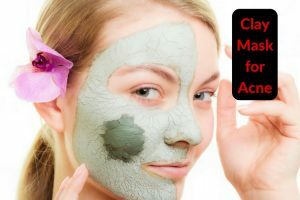 How to Use Clay Mask for Acne..? There are different types of clays like bentonite clay, green clay, kaolin clay and many others. We have mentioned various methods using them below. Choose any one as per your convenience and try it regularly to achieve the results. This process helps to clean the clogged pores, shrink them and reduce the pimples. Mix enough amounts of bentonite clay and water. Apply a thin layer of the paste on affected areas. Rinse off with water and pat dry with a soft towel. Alternatively, you can use lemon juice instead of water. Mix enough amounts of clay and water to make a thick paste. Add few drops of tea tree oil and mix well. Apply the mixture over the affected areas. Leave it on for 5 minutes and rinse off with lukewarm water. Apple cider vinegar balances the pH level of the skin and fights off the bacteria causing acne. Mix enough amounts of bentonite clay and apple cider vinegar to make a thick paste. Spread a thin layer of the mixture over the affected areas. Gently rub in circular motions for few minutes. For extra benefits, add 1 teaspoon of coffee grounds. Process 1: Oatmeal absorbs the excess sebum and oil. Combine 1 tablespoon bentonite clay, 1 – 2 tablespoons of water, 1 tablespoon oats (grounded) and 4 drops of essential oil. Spread the mixture over the affected areas. Leave it on for 10 – 15 minutes and rinse off with water. Process 2: Baking soda balances the pH level of the skin. Make a paste by mixing enough amounts of bentonite clay, baking soda, oatmeal powder, water and any herbal tincture. Apply the solution over the affected areas. Leave it on for 20 minutes and rinse off with lukewarm water. Yogurt exfoliates the accumulated dead skin cells, tightens the pores and fades the blemishes. Mix 1 tablespoon each of bentonite clay and yogurt. Spread an even layer of the mixture over the affected areas. Let it rest for 20 minutes and rinse off with water. Combine 1 tablespoon each of bentonite clay, honey and water. Stir well and apply an even layer of the mixture over the affected areas. Combine 1 tablespoon of green clay, 2 tablespoons of water, 8 drops of geranium oil and 4 drops of patchouli oil. Massage the mixture over the affected areas for few minutes. Rinse off with lukewarm water followed by cold water. Dilute enough green clay in 2 tablespoons of chamomile tea, 1 tablespoon of macadamia oil and 12 drops of clary sage oil. Leave it on until it starts to dry. Mix 1 ounce of green clay, 3 tablespoons of rose water and 7 drops each of lavender oil and tea tree oil. Alternatively, you can avoid lavender oil and tea tree oil and follow the remaining process. Steep herbal tea by adding a bay leaf into a cup of hot water. Combine enough amounts of green clay, herbal tea, 1 drop tea tree oil and 1 drop eucalyptus oil. Wash the affected area with water and pat dry. Apply the mixture over the affected area and leave it overnight. Rinse off with warm water the following morning. Note: You can store the leftover the mixture in a non metal container for future use. In a clean mug, add some warm water and 1 teaspoon of thyme (dried). Cover the mug and let it steep for an hour. Mix equal amounts of kaolin clay and thyme infusion. Stir well and apply it over the affected areas. Leave it on for 25 minutes to dry. Repeat 2 times a week to get rid of the breakouts. Combine 1 tablespoons of kaolin clay, 1 – 2 teaspoons of oatmeal powder, 1 teaspoon each of chamomile, lavender and rose herbs. Add enough amounts of water and mix well. Apply an even layer of the mixture over the affected areas. Leave it on for 25 minutes and rinse off with water. If you have dry skin, use yogurt instead of water. If you have sensitive skin, use honey instead of water. Combine 1 teaspoon each of kaolin clay and ground oatmeal, pulp of 1 – 2 strawberry and enough amounts of yogurt to make a thick paste. Apply a thin layer of the mixture over the affected areas of the skin. Let it sit more than 25 minutes. Wet your hands and gently scrub off the mixture. Alternatively, you can use honey instead of yogurt. Peel the skin and blend 1/2 apple. Combine apple paste, enough amounts of kaolin clay and 1/2 teaspoon of dried tulsi leaves. Mix well and apply over the affected areas. Combine 1 tablespoon each of white kaolin white clay and honey. Add 1 teaspoon glycerine and mix well. Apply it over the affected areas and leave it on for 10 minutes. Mix 2 tablespoons each of red clay and rose water, 1/2 teaspoon jojoba oil, 2 drops each of chamomile essential oil and rose essential oil. Stir well and apply it over the affected area. Repeat the process 2 times a week. This process helps to soothe the acne on back, chest, legs and other parts of the body. Into a jar, add 1 – 4 cups of morocco red clay and enough water to cover the clay by a couple of inches. Mix the jar until the clay dissolves completely. Fill your bath tub with lukewarm water and add the mixture into it. You can add any essential oils of your choice. Soak for at least 15 – 20 minutes. Bath normally and pat the skin dry with soft towel. Repeat once in 2 days. In a bowl, mix 2 teaspoon of morrocoo red clay, 1/2 tablespoon mashed avocado, 6 teaspoons of rose water, 4 teaspoons of oatmeal and few drops of argan oil. Mix well and apply on the affected areas. Repeat the application 2 times a week. Grind handful of neem leaves in to a paste using boiling water. Mix enough amounts of neem leaves paste, a pinch of turmeric and rhassoul clay. Repeat the application 3 times a week. Alternatively, you can use neem powder instead of fresh neem leaves. Combine 1 tablespoon each of Rhassoul clay and ground oatmeal. Add enough amounts of apple cider vinegar and mix well. Apply on the affected areas and rinse off with water. Mix enough amounts of rhassoul clay and honey. Apply over the affected areas. Combine mashed avocado (1/4th piece), 1 teaspoon yogurt and enough amounts of rhassoul clay. Mix enough amounts of rhassoul clay, 2 – 3 drops each of neem oil and rose hip oil. Add enough water and make a thick paste. Apply over the affected area and leave it on for 15 minutes. Mix 2 teaspoons of fuller’s earth, 1 teaspoon each of rose water and honey. Add 2 – 3 drops of tea tree oil and stir well. Apply to the affected areas and leave it on for 15 minutes. Rinse off with water and pat the skin dry. Alternatively, you can use lemon juice instead of honey. Peel and blend 1/2 cucumber. Combine cucumber paste and enough amounts of fuller’s earth. Mix 2 tablespoons of fuller’s earth and 2 egg whites. Stir well and apply over the affected areas. Combine 2 – 3 tablespoons of fuller’s earth, a pinch of turmeric and 1 tablespoon of freshly extracted aloe vera gel. Mix 1 tablespoon pink clay, 2 tablespoons of rose water and 1 drop orange essential oil. Stir the ingredients well and spread a thin layer over the affected areas. Combine enough amounts of Dead Sea clay and agave nectar. Alternatively, you can use honey or manuka honey instead of agave nectar. Mix 2 parts Dead Sea clay and 1 part ground coffee. Gently massage the mixture over the affected areas for few minutes. Leave it on for another few minutes and rinse off with water. Steam your face before applying any mask mentioned above for better results. Steam helps to open the pores. Avoid methods that contain ingredients you are allergic to. If any clay mask is making your skin very dry, apply a very small amount of coconut oil, shea butter or any other natural moisturizer. Don’t squeeze, prick, scratch or rub the pimples as can lead to scars or infections. Avoid touching your face or pimples with dirty hands. Avoid too much sun exposure and cover your skin maximum while strolling in dusty or polluted areas. Use mild soaps that don’t contain paraben, lauryl sulphate and other chemicals. Exfoliate regularly but don’t scrub too harsh as it can lead to other skin problems. Cleanse your face regularly especially before going to bed and after coming home from outside. Drink plenty of water to stay hydrated and flush out toxins from the body. Include fresh vegetables and fruits in your daily diet. Avoid oily, fat and deep fried foods. Did you find this article helpful? We hope you will try the remedies regularly and get rid of stubborn acne. Write to us your experience and suggestions in the comments section below.